An oasis In the heart of Old Town with beautiful gardens, fountains and birds. An oasis In the heart of Old Town with beautiful gardens, fountains and birds. Loaded with charm and flooded with light! Built in the 20's, this home has been carefully restored and updated without sacrificing the special esthetic of the period. From the original clear Douglas fir floors, antique light fixtures, wide floor and window moldings to the vintage gas pot bellied stove (fireplace), the large bathroom with soaking tub and pedestal sink. The master bedroom has a queen bed with a black iron headboard, antique oak highboy dresser and vintage chandelier. The second bedroom also features a queen bed with a period headboard and additional vintage touches. The kitchen is sunny and bright with hand painted tiles and windows that look out onto the garden fountain and bird feeders. And the location couldn't be better! Just one block from downtown shops, restaurants and the vintage Bay Theater. Only 2 blocks from the Embarcadero and the waterfront! Just a short walk to the Morro Bay Aquarium, to rent kayaks or go whale watching. You can even see Morro Rock from the front porch and yard. Sit under the gazebo with morning coffee or a glass of wine, looking out to the bay and listening to the songbirds. This is a truly special place. Cozy and comfortable with down filled sofa & chair. A small and intimate drop leaf table in the living room with two arm chairs. The coffee table is also an option. There is aditional dining for 4 in the front yard, under the gazebo and chandelier. Living room and master bedroom. Landscaped gardens front and back. No lawn. Morro Bay Golf Course only 1 mile away. Darling cottage. TV in front room and master bedroom. Has everything you need plus relaxing back yard patio with fountain, seating, BBQ and bird feeders. Two blocks from water and walking distance to great restaurants and shopping. 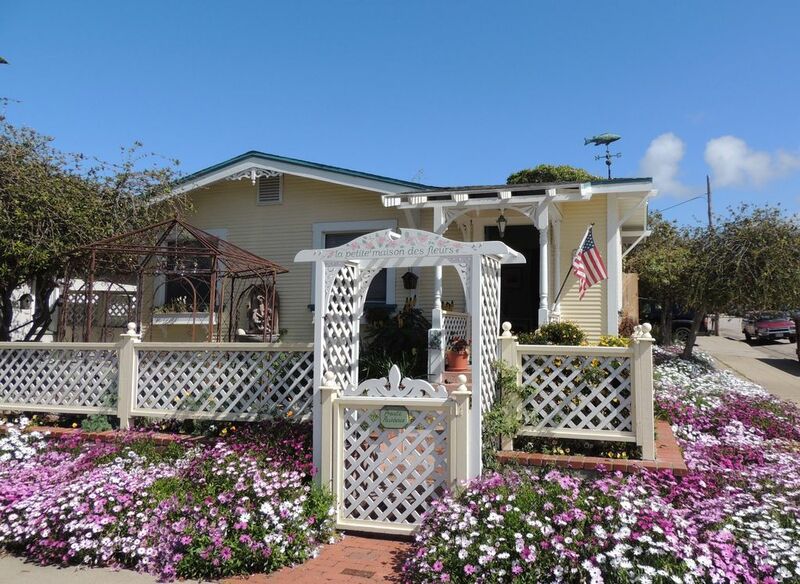 Great house with a wonderful location in Morro Bay! We had a wonderful stay in this cute cottage. Great location, within walking distance to everything. Loved the garden with the bird feeders and water fountain. Kelly and Bryan were great hosts. The cottage is quite charming and homey. This was my second stay and I can’t image staying anywhere else. You have all the comforts of home. The decor and charm is what makes the cottage my go to place to stay. It’s so convenient to everything. You walk across the street to the beach, stores and restaurants. I didn’t, but you can walk to the “rock”. Since it’s on Main Street, you have walking access to more shops and restaurants. I love it there and highly recommend staying at the Cottage. The owners are wonderful people and thought of everything, when stocking the house with necessities, to make your stay comfortable. Lovely little cottage. Clean and comfortable. Clean, comfortable and very convenient, but bring your own hotspot because WIFI is terrible. We would stay here again.